Members of two primitive tribes in East Singhbhum district, Jharkhand, are trying to retain their forestland in a unique manner. The sabars and birhors, food gatherers and rope makers, have taken to cultivation. They have cleared tracts of forestland on which they have lived for generations, to grow mango, guava, corn, pulses and vegetables. "We started clearing the forestland when we were told about the Forest Rights Act, 2006 (fra), early last year," says Dhananjay Sabar of Tomangkocha village in the district. Under the fra, they are entitled to the forestland they cultivate. Besides, food gathering and rope making did not yield much, monetarily, and the tribals wanted to become more independent on the food front. Dhananjay and other sabars and birhors in the village have cleared four hectares of forestland to begin cultivation. They also plan to plant sabai grass, the raw material for making ropes, to not let go of their earlier occupation. "We used to sell whatever product we collected from the forest but now we will take to agriculture," says Raju Sabar of Jhoblakocha village that has about 30 sabar families. As an experiment, the tribals tried growing vegetables and fruit trees in their backyards last year. Socio Economic and Education Development Society (seeds), an ngo that works out of Jamshedpur for the cause of the primitive tribes, gave saplings to about 40 families in Tomangkocha. "We were thrilled with the returns. We were told that we could do the same thing on a larger scale on the forestland. So we cleared the forestland to prepare for this sowing season," says Mohan Sabar, also from Tomangkocha. Villagers in Jhoblakocha have cleared about three hectares of forestland and are preparing the bed for the fruit trees, which will border the field. The forestland, they claim, comprised bushes and shrubs. This year, seeds has distributed 639 saplings of mango, guava, seesham and lemon to 80 families in both the villages. They have also distributed seeds for water gourd, bitter gourd, beans and brinjal. "When cultivation begins, about 400 people will benefit," said Shubhra Dwivedy, executive director, seeds. The villagers got the idea to begin cultivation from the baiga community when seeds took a team of seven sabars and birhors for an exposure trip to Raipur district in Chhattisgarh in early 2007. Baigas, a primitive tribe in Chhattisgarh, used to be food gatherers, but shifted to agriculture after the forest department drove them out of their original habitat in the Rajarani hills. "They were growing millets like kodo and kutki, besides corn and beans. We realized that this would make us self-sufficient too and we wanted to do it on a large scale," says Ramdas Birhor of the Tomangkocha village. The enthusiasm of the villagers is evident in the fact that they had planned the mode of irrigation of the fields well in advance. 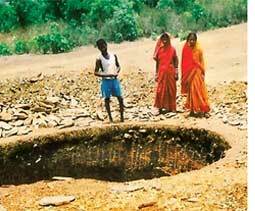 Since the villages are rain fed, they started digging ponds early in the year--one in each village to ensure that once the monsoons are over they have sufficient water for the crops. Land is collective property here. All the families are the beneficiaries and the earnings from the field are to be divided equally amongst all of them. The capital for the venture is also being organized as one self help group. Aven Mahila Samiti formed in March this year comprises women who work with stone crushers. They deposit a weekly amount of Rs 5 towards improving agriculture facilities. "We are looking at opening a bank account so that the farmers can use the money to buy inputs for agriculture. This money could also help women start small businesses later under various self-employment schemes by the government," M N Jha, project coordinator, seeds, contends. Another group, called the Sabar Samooh, was formed in April 2007. They too have been depositing Rs 5 per person per week. The villagers say they have been lucky so far because the East Singhbhum district administration hasn't interfered much. "The block development officer did come and enquire when we were clearing the forest. But we stood firm and made our point that this was our land. After all, this is all that we have. How can we move out?" asks Ramdas. Adds Raju, "Initially, we were accused of destroying the forest but we explained to them that this was our land. The forest department came and demarcated the line beyond which we could not move but after that they never bothered us again."